We just celebrated my niece Grace's 13th birthday. My brother in law Jeff smoked some chicken and she picked out the side dish to go with it. I just loved how this salad turned out. It is very light and summery! We are huge pasta salad lovers, so this is right up our alley. Hope you enjoy it too! 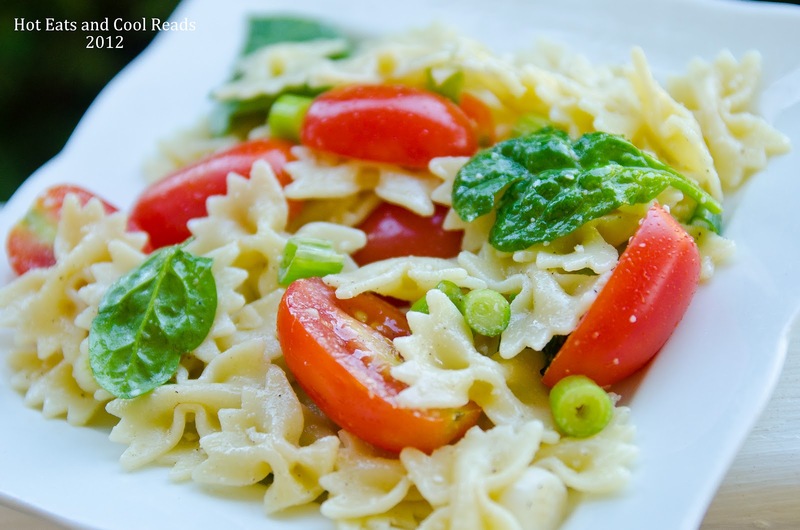 In a large bowl, combine pasta, spinach, tomatoes and scallions. In a small bowl whisk lemon juice, mustard, garlic, olive oil, and sugar until combined. Drizzle sauce over pasta, add parmesan, salt and pepper and toss to evenly coat the pasta. Chill until serving! Thanks to my amazing sister Shannon for taking the beautiful pictures in this post! You can see more of her work at her blog Speaking in Plain Shamish! THis is ideal. 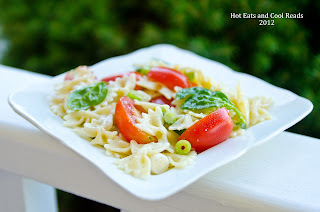 I love these pasta salads with things that are in season. YUM! This is my kind of pasta salad! Delicious! Thank you! It is such an easy one to put together! So pretty and sounds great too! Thanks!! It is a very good one! Thank you!! I agree, it is very refreshing! Hope you like it! Thanks for stopping by Beverley! My kind of summer dinner :) Looks delish! Thanks so much for linking up to Creative Thursday this week. I can't wait to see what you link up next. Have a great weekend. Thanks! It's such a good one! I think pasta and spinach should be married.....They go so well together. The salad looks fabulous! Thank you for linking to Foodie Friends Friday. Sheena~ We too are huge pasta salad lovers. I have some homegrown tomatoes sitting on my counter and I know what side we are having with our Sunday supper. Thanks so much for being so faithful to the Weekend Potluck and linking such delicious dishes! Have a terrific weekend! This salad looks really good. We love pasta here as well! Thanks for sharing on Foodie Friends Friday! Please come back next week with another GREAT recipe! Great recipe... Can't wait for my tomatoes to be ready so that I can try this... think it would be better with fresh garden tomatoes. Thanks for sharing at Foodie Friends Friday. I can't wait to make this when my tomatoes in the garden are ready! This looks like a tasty and healthy recipe! Thanks for sharing on Foodie Friends Friday! Thanks so much! Glad I could share! This just screams summer yumminess!! Thank you for sharing it on Manic Monday! Thanks Bobbi! So glad to link up with you! oh yum!!! and how perfect now with all the garden tomatoes. looks so pretty too. thanks!! !